New Level Coin provide no information on their website about who owns or runs the business. The New Level Coin website domain (“newlevelcoin.co”) was registered on November 21st, 2017. Ricardo Joseph is listed as the owner, through an address in Johannesburg, South Africa. I wasn’t able to find anything further on Joseph in connection with New Level Coin or the MLM industry. New Level Coin has no retailable products or services, with affiliates only able to market New Level Coin affiliate membership itself. 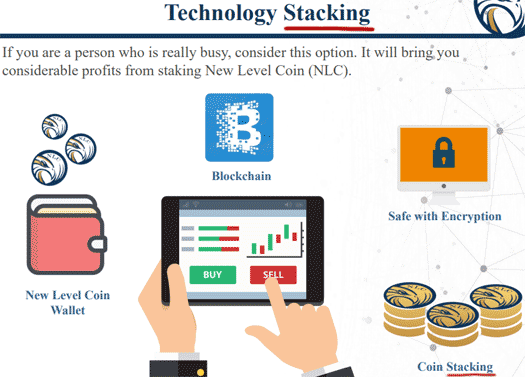 New Level Coin affiliates purchase NLC points from the company. New Level Coin don’t disclose how much they’ll sell NLC points to their affiliates for. Once acquired, NLC points are then “lent” back to New Level Coin on the promise of an advertised 90 day ROI. New Level Coin affiliate membership is free, however free affiliates can only earn referral commission. Full participation in the New Level Coin MLM opportunity requires a minimum $100 investment. New Level Coin claim to generate ROI revenue through a “secret arbitrage strategy”. The company claims this strategy provides it a ‘unique advantage to exploit the volatility within the cryptocurrency market‘. For those unfamiliar with the term, arbitrage is simply buying low somewhere and selling high somewhere else. New Level Coin provide no evidence of arbitrage taking place, nor does it assert any other form of external ROI revenue. This is a problem, as while where New Level Coin might conduct arbitrage might be secret, providing evidence of arbitrage taking place in no way compromises their “secret strategy”. The reason of course no evidence of arbitrage taking place is provided is because it isn’t happening. Furthermore New Level Coin’s arbitrage claims fails the Ponzi logic test. If Ricardo Joseph was able to legitimately generate a ROI of up to 45% each month through cryptocurrency arbitrage, why opt to share that revenue with randoms over the internet? Surely the smart thing to do with would be to acquire a small loan, generate 45% a month, compound ROI payments and retire as the richest person on the planet in a few years? Same as any other ICO lending scheme, the only verifiable source of revenue entering New Level Coin is new affiliate investment. Using newly invested funds to pay existing affiliates a monthly ROI of up to 45% makes New Level Coin a Ponzi scheme. The company’s admins (who are typically anonymous) offload worthless pre-generated points in exchange for real money. In this case it’s NLC points. When a predetermined threshold is reached, the New Level Coin’s admins pull a runner with what’s left. Early New Level Coin investors make a bit of money (mostly via recruitment of new investors). But same as any other Ponzi scheme, the reality of such scams is that the majority of participants eventually lose money. A good case-study in the collapse of an ICO lending Ponzi scheme is BitConnect. Launched in early 2017, a year later BitConnect’s admins did a runner and the public value of otherwise worthless BCC points crashed. This resulted in widespread investor losses. As a result of using the same business model, New Level Coin and its gullible investors will go down the same path.